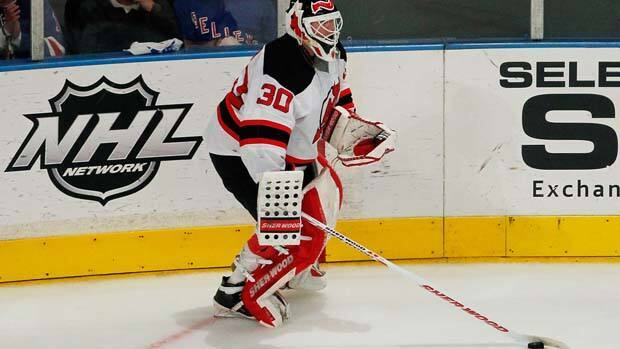 Despite his horrific giveaway on what was the tying goal for the Devils in Game 5, the puck handling skills of Marty Brodeur have helped offset the continued excellence of Henrik Lundqvist in their Eastern Conference final. Brodeur now has four assists, which is a new playoff record for a goaltender in a single series. Glenn Healy, who was one of many who shared the old record with Brodeur, told us on Hockey Night in Canada Radio that there is a simple message here for the New York Rangers: keep the puck away from Marty Brodeur, he is killing you with his puck handling abilities. The New York Rangers continue to fight recent Stanley Cup playoff history in having to extend a third straight series to seven games if they are to make it to the Stanley Cup final. No team has ever won the Stanley Cup (since 1967) after winning their first two series in seven games. The Montreal Canadiens in 2010 won their first two series in seven, but they lost four games to one to the Philadelphia Flyers in the third round. The playoff juggernaut that has been the Los Angeles Kings has seen no shortage of elite players like Mike Richards, Dustin Brown, Anze Kopitar, Drew Doughty, Jonathan Quick getting their deserved accolades. Add to that a plugger like Dwight King and an underachiever like Dustin Penner. To me, their most underrated player has been rookie defenceman Slava Voynov. He's a 2008 second-round pick from Russia, who played two years in the American Hockey League with Manchester before cracking the Kings' defensive corp early this season. While other young non-North American defencemen like Ottawa's Erik Karlsson and Adam Larson of New Jersey have struggled in the playoffs, Voynov has brought his game to an even higher level in his first NHL playoff experience. Another young defenceman who picked his game up in the Los Angeles series was Oliver Ekman-Larsson of the Phoenix Coyotes. He was their first-round pick (6th overall) in the 2009 Entry draft and Brian Lawton has told me that the Tampa Bay Lightning staff had a hot debate over whether to take Ekman-Larsson or Viktor Hedman with their second overall pick that year. After a strong regular season, Ekman-Larsson had an ordinary playoff for much of the first two rounds and the first three games against Los Angeles. His last two efforts showed more of what he had evolved into over the regular season. I have heard of wily Coyotes. I hadn't heard so much of whiny Coyotes. A great season and playoff run I felt was somewhat tainted by their excessive complaining and whining about the officiating after being eliminated by Los Angeles. Let's face facts: the Kings flat out outplayed the Coyotes in the first three games of their Western Conference final. I will cut Shane Doan some slack out of respect for what he has stood for over his distinguished career. But Mike Smith and Keith Yandle sounded like the odd parent I have encountered at a minor hockey game. Doan was constructive, they were childish. Great news for Toronto Maple Leaf fans with the excellent playoff play of the Toronto Marlies as they are one win away from making it to the Calder Cup final. Jake Gardiner has continued his excellent play on defence, Ben Scrivens has been outstanding in goal, and other youngsters like Matt Frattin and Jerry D'Amigo have flourished up front. Missing one name? Yes, seems like Nazim Kadri continues to be a "prospect" that Leaf officials remain underwhelmed in talking about when they discuss the playoff success of the Marlies. One interesting player to watch in the Memorial Cup is defenceman Olli Maata of the London Knights. The Finnish born defenceman was a consensus top 10 rated player at the start of this season. He has struggled at times with the North American style of play in junior hockey, and his ranking was slipping towards exiting the first round. Maata has rebuilt his reputation with his strong play when it counted the most, during the OHL playoffs for the Knights. He seems to be back as a top 10 ranked player and could climb even a bit higher. Vancouver Canucks general manager Mike Gillis joined us on Hockey Night in Canada Radio just after being signed to a new contract extension with the Vancouver Canucks. He poured a little bit of cold water on what we felt was a done deal for the off season. Gillis stressed that it wasn't a sure thing that both Roberto Luongo and Corey Schneider wouldn't be back with the Canucks next season. Gillis stressed that Luongo had not requested a trade but rather had indicated he would look at waiving his no-trade clause should the Canucks have deal to their liking. With all of the coaching vacancies in the NHL, I like the fit of Paul Maurice for the Washington Capitals. Meanwhile frequent HNIC Radio colleague Mark Osborne feels that Gerrard Gallant of the Saint John junior team should be a No. 1 NHL coaching candidate again.